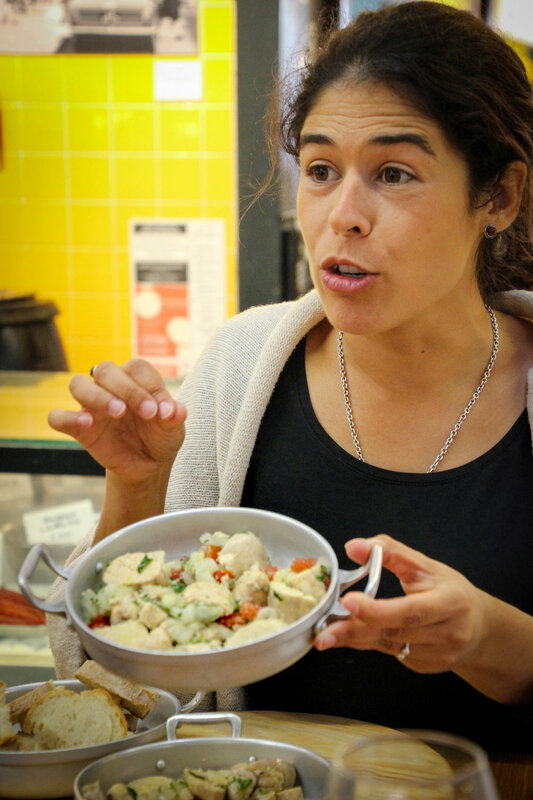 For my first time in Lisbon (and Portugal) I took the Tram 28 -Campo de Ourique Food & Cultural Walk with Taste of Lisboa. This tour stood out among all of the tours I have taken across the world for its exceptionally tasty and generous bites, refreshing and provincial beverages, and unique "eating like the locals" approach to the tour. We started our tour off in Prazeres Cemetary, one of the most famous cemeteries in Portugal. Our guide, Madalena, introduced us to the Campo de Ourique, a Portuguese Parish that dates back to the 18th Century, and the neighborhood we would be eating our way through during the tour. The stone streets weave through 19th Century buildings covered with Art Nouveau mosaic tiles, a decorative style of art and architecture. This working class neighborhood has transformed in recent years to a more posh neighborhood, but this "city within a city" still retains its activist roots. The food we tasted fit the ambiance of the neighborhood: Portuguese classics with a modern twist. 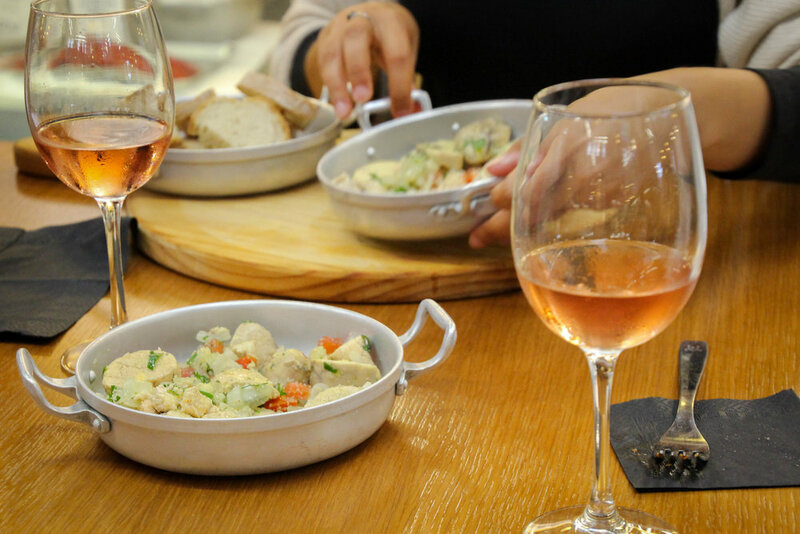 Known as the trendsetter neighborhood, chefs tend to come to Campo de Ourique to experiment with new Portuguese concepts before introducing them to the rest of Lisbon and beyond. That being said, a lot of the food we tried here is indicative of the neighborhood and unlike anything else you will try elsewhere. 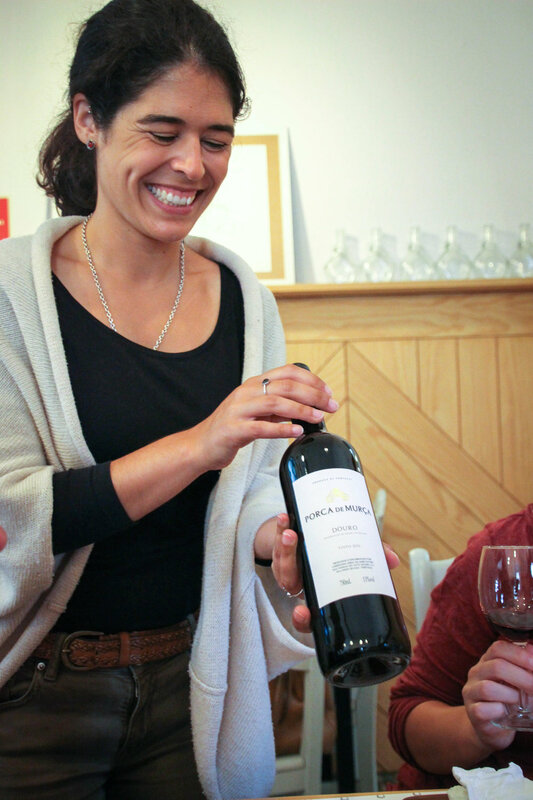 It takes a true local, like Madalena, to show you these neighborhood gems and talk you through the history of the tastings. We walked along the hand-placed cobblestone streets past some bold churches. Portugal is a predominantly Catholic country (approximately 84% of the population). Consequently, churches such as this one are found all over the city center. At our first stop we tasted the O Melhor Bolo de Chocolate do Mundo , which translates from Portuguese to English as "The best chocolate cake in the world". Just for clarification, what makes it the best chocolate cake in the world is not due to the lack of calories, as another tour guest jokingly suggested. This is not a humble title for a cake shop. However, no chocolate cake in the world tastes like this, which is likely why they keep their recipe a secret! The meringue outside layers of the cake hold together the mousse-like insides. Light and heavy at the same time, this chocolate cake was the most decadent and perfect way to start off our tour. We paired our generous slice of cake with a café (i.e. an espresso) which in Lisbon is called uma bica. 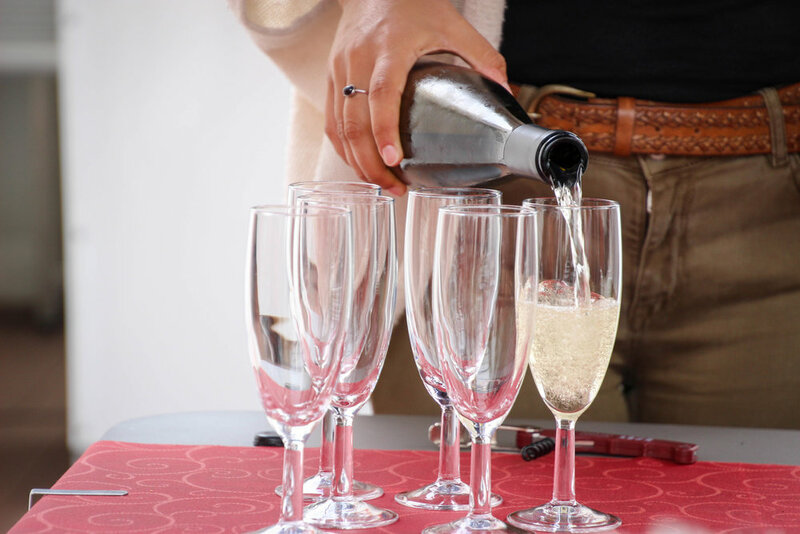 It is not uncommon for most Portuguese to drink 2, 3, or 4 bicas a day! Coffee drinking is a habit imported from Brazil, which was one of Portugal's former colonies. Even today, the majority of the coffee beans used in Portugal come from former colonies. 93% of Portugal's natural border is water. 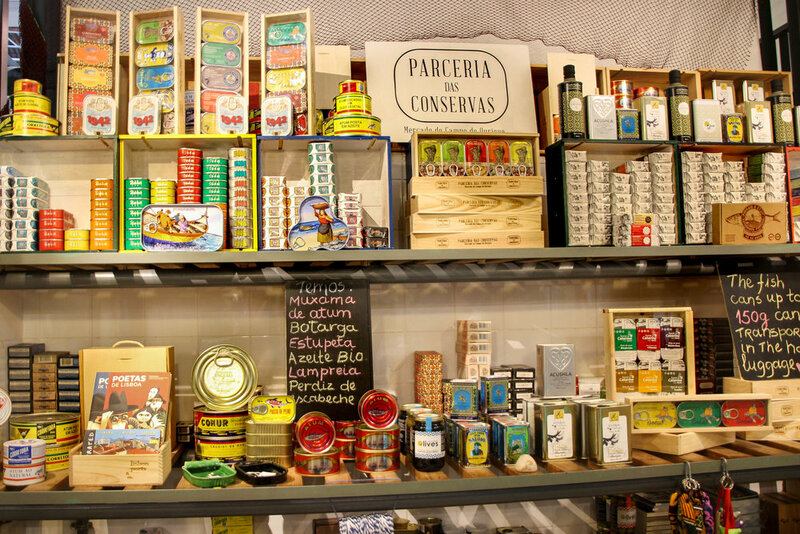 It is no surprise then that much of Portugal's gastronomy and economy is seafood based. Locals rejoice in the early to late summer months when sardines are in season. Cod, however, which makes up the basis of bacalao (arguably, the most famous dish indicative to Portugal) comes via Norway and arrives preserved in salt. Even though this old preservation trick is no longer needed, thanks to refrigeration, this salty fish is embedded into the Portuguese diet and here to stay. The market is full with other amazing seasonal produce and delicacies. 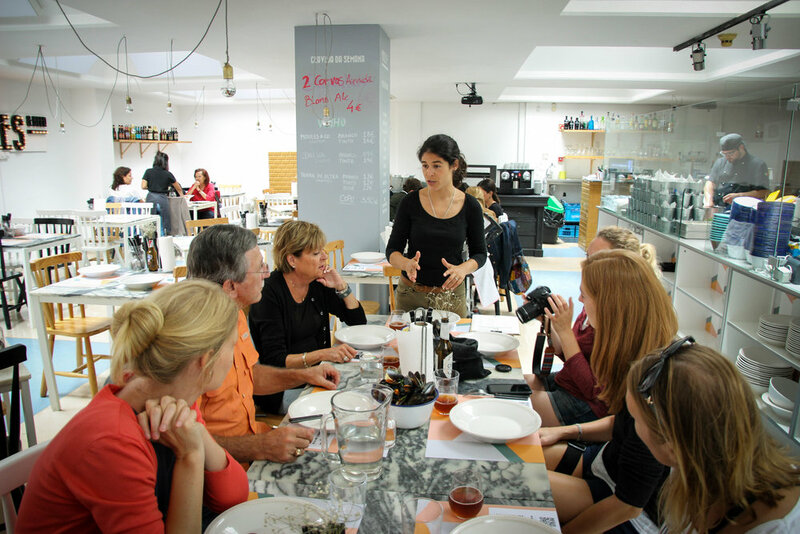 Madalena pointed out the sea snails, a summertime favorite in Lisbon. The fruits were abundant and literally bursting with ripeness. It was all I could do to retrain myself from eating the crate full of fresh figs. Madalena guided us through many of the stalls in this local market and gave us ample suggestions for things to try next time we come back. Even though the Portuguese eat a lot of seafood, the majority of what they catch is exported. 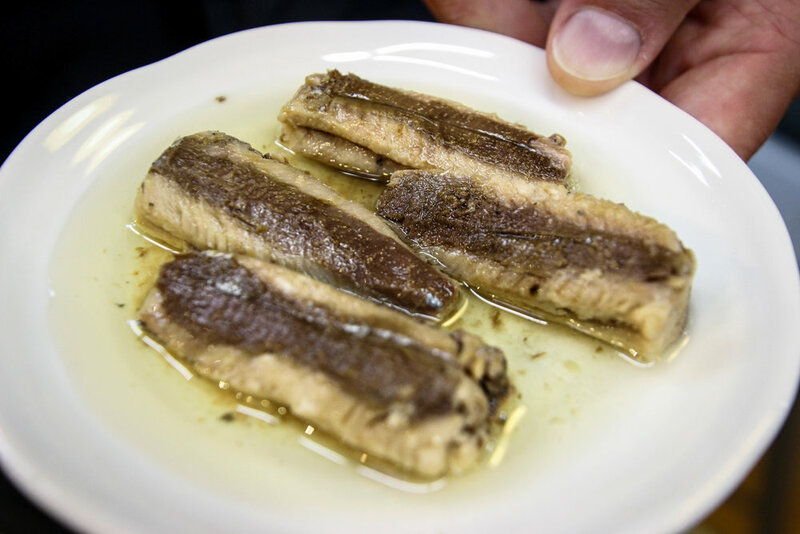 Canned sardines are a popular export, and at our second tasting we sampled a myriad of these tiny, canned fish that came bathed in olive oil. This was served with some fresh sliced baguette and a glass of local rosé. Enjoying the many samples in front of us, we were stunned when a fish roe salad was served immediately after (more food!). These large slices of the fish egg sacks where tossed and seasoned with olive oil, tomatoes, and onions. Like seafood, pork is also at the heart of Portuguese cuisine. The majority of the pork industry in Iberia (Portugal and Spain) is set up so that Portugal raises the swine, Spain takes care of the processing, and then some of the final product is brought back to Portugal. The premium ham comes from acorn-fed pigs. If it is cured for 5 years, it can cost around 300 euros per kilo. At Pigmeu, another stop on the tour, we had a platter of porky-dishes to try from: pork croquette, tomato crackling, and a slow cooked pork sandwich. We paired our generous sampler with a glass of red wine. On counter lined with Portuguese wines, hung my favorite sign, which represents the love Portuguese people have for their food: "In the day I don't sleep because I'm thinking of you. In the night I don't sleep because I am hungry." 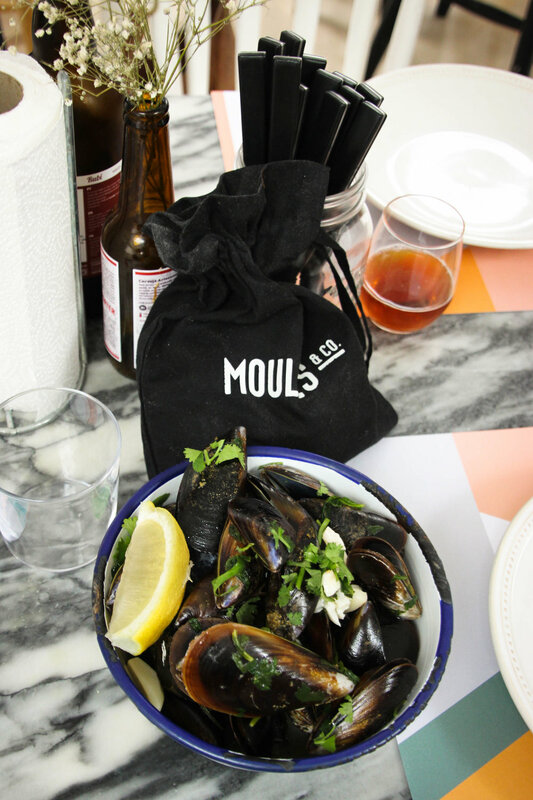 For another seafood stop we tried moules (or mussels) and beer. Cooked in white white, cilantro and a lot of olive oil, these steaming mussels were a fun item to share around the table. 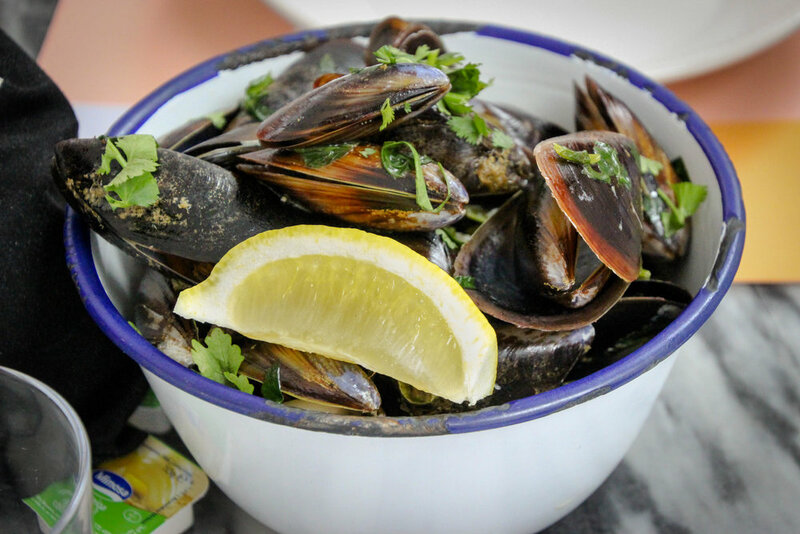 No water or salt is added to the sauce - the mussels contribute plenty of that on their own! 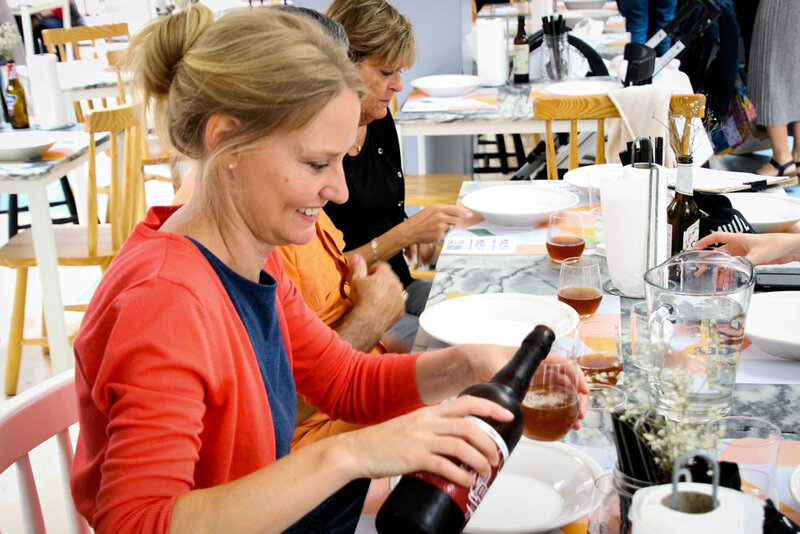 We paired the muscles with a local craft beer, as well as some absorbent bread to dunk into the delicious juices that the mussels bathed in. The interior decor was also fun, hip, and modern, making this a perfect spot to come to with a group of friends. After a short stroll, we headed to the rooftop of a hidden local's spot to try some comfort food, or "mammy's food". We ate pataniscas (codfish fritters) and baked beans with soupy rice on the terrace. After already spending a few hours with the group, for this meal it felt like gathering for lunch at a friend's house. 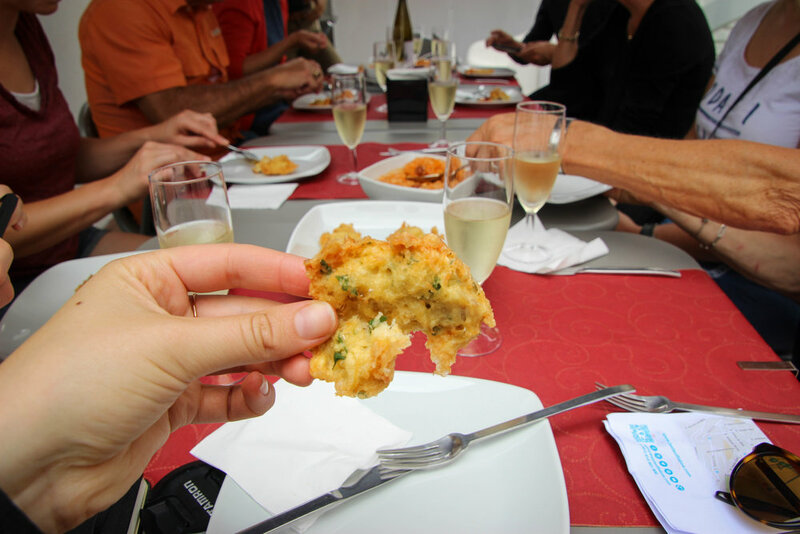 The delicious cod fritters were tempura battered. Fun fact: tempura is a technique that the Japanese actually adapted from the Portuguese. In general, Portuguese food is fairly unique to Portugal and any fusion foods are a recent phenomenon. However, the Portuguese flavors are attributed to spices and herbs, such as cinnamon and cilantro, that were brought over from the former colonies. Madelena served us vinho verde, or green wine. This was my first time trying wine made from such young grapes. Acidic and fruity, it perfectly complemented this unpretentious and homey food. "Remember," Madelena said, "food is for the stomach. Dessert is for the heart." Even though we were all so full at this point, we made room for one last treat at our last stop. We terminated our tour with a refreshing green and mint tea as well as a a sponge cake. This dish is also known as convent cake, because it was made by the nuns who had leftover egg yolks, since they used egg whites to dye the priest's robes. Sensible and letting no part go to waste, they made this custardy and rich egg yolk dessert. Despite being stuffed, this tour only scratched the surface of the amazing foods offered in Campo de Ourique. 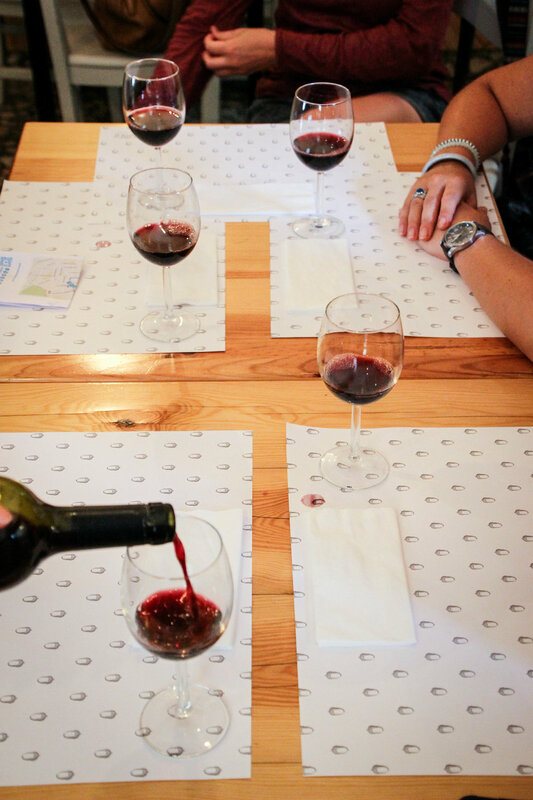 Fortunately, Madelena gave us a map and a list of other suggestions for tastings and activities in the area for another time. This tour was sponsored by Taste of Lisboa, however all opinions, writing, and photos are my own.